My name is Mark Harstick. My wife Deb and I are the owners of Fisher Creek Kennels. Our love for German Shorthairs began in 1994 when we owned our first German Shorthair Pointer, Sherman. Sherman was a surprise Christmas present from my wife Deb. I was working in the shop, and Deb came in with a puppy under her coat. Sherman grew to be a wonderful companion and a fine hunter. We hunted with Sherman for a couple of years before expanding our family to include two female German Shorthair Pointers. In 1997, when our youngest son left home to go into the service, we purchased Sadie and Abby from KD Hunting Acres in Tekamah, NE. In 1999 and 2000, we began breeding pups with Sherman and our two females. In a span of about 4 years, we sold approximately 80 pups. In 2004, we took a short break from raising pups. However, in 2005, we purchased another German Shorthair Pointer male named Griffey from Top Gun Kennels in Iowa. In 2007, Griffey received his Master Hunt title and we decided to get back into the puppy business. At this time, we bought another German Shorthair Pointer puppy named Hannah from Premiere Gun Dogs in Hallam, NE. Hannah is currently working on her Senior Hunt title and is expected to complete it this year. 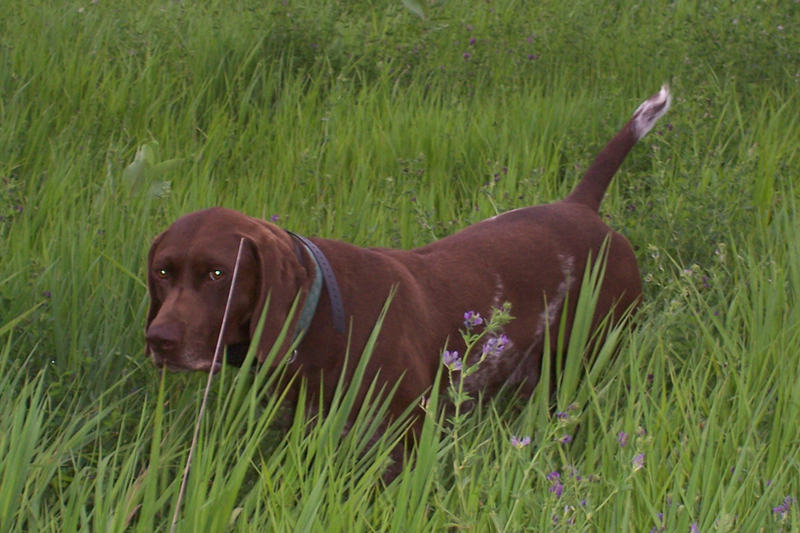 In the winter of 2009, we purchased another female German Shorthair Pointer named Mindy from Premiere Gun Dogs. Mindy has received her Senior Hunt title. In the summer of 2009, Griffey and Mindy had puppies. We had such a good response to selling the puppies that we decided to have Griffey and Hannah breed again. Aside from creating a great business, we have had the pleasure of enjoying and sharing in a relationship with all of our dogs. They have become such an important part of our family! Griffey, Mindy, and Hannah go hunting with me every weekend during the hunting Season. My oldest son, along with other friends, joins us for some of these adventures. Our dogs are very kind natured and love having visits from our four grandchildren! And, of course, our grandchildren love to “give the puppies treats!” As a side hobby away from the family, all three dogs participate in Hunting Competitions.